Answer: There is nothing to be said against DVDFab HD Decrypter being the great DVD tool to copy and rip DVD to other videos or portable devices. However, despite DVDFab claims its full compatibility with Mac Mountain Lion, DVDFab does not live up to its hype. So when it comes to the latest Mac version- macOS Sierra, DVDFab seems to be at a loss, like the embarrassment suffered by Liza. As a result, many Mac users have to seek for a DVDFab replacement to best suit Mac's operating systems, Mavericks, Yosemite, El Capitan or macOS Sierra. Wanna get the best alternative to DVDFab for Mac to help you guys rip convert DVD to various media files? Hold on, this article will introduce a powerful and well-known DVDFab for Mac alternative which is perfectly compatible with Mac OS, that is MacX DVD Ripper Pro, which has been updated to be compatible with even the newest Mac El Capitan and Sierra flawlessly. Besides fully supporting Mac El Capitan, this DVDFab for Mac replacement also supports ripping DVD to more output formats like FLV, MKV, MOV, MPEG, MP4, AVI, WMV, etc while DVDFab only supports MPEG-4, H.264, AVI, MP4, WMV, etc. Moreover, when the Apple's new release of iPhone 6s, iPad Air 2, iPad Mini 4, DVDFab seems to take no action and does not set any profiles for them, while MacX DVD Ripper Pro has always been paying attention to the newest digital trend and makes immediate response to them. This is why MacX DVD Ripper Pro is the best replacement of DVDFab for Mac. Step 1: Free download and run this DVDFab for Mountain Lion, click "DVD Disc" or "DVD Path" button to import the DVD on your Mac OS Mountain Lion. Step 2: Select the output format as you want. 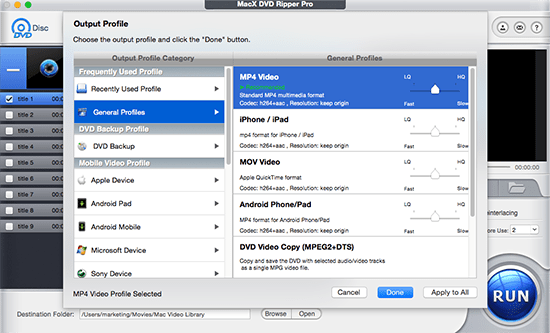 With the help of the DVD ripper similar to DVDFab for Mac, you can easily rip DVD to the video formats you desire like MP4, iTune, MOV, Music, MPEG, etc, backup and put DVD to iPad, iPhone, iPod, etc. Step 4: Click the "RUN" button to start ripping DVD on Mountain Lion with the DVDFab for Mountain Lion equivalent. Additional information: You can use MacX MediaTrans to sync the converted DVD movies to iPhone iPad instead of the complicated iTunes sync after the DVD ripping with DVDfab for Mac. MacX DVD Ripper Pro is also famous for great DVD decryption ability. With this alternative to DVDFab Mountain Lion, you can easily decrypt and rip copy protected DVD to the video formats and portable devices easily.